This rare and valuable print is sought after by collectors worldwide. Originally published in 1992, this edition sold out quickly. Signed by six top-scoring JG-52 combat aces accounting for 1,268 aerial victories! Overall size: 34 1/2" x 25" Image size including colored border: 30 1/4" wide x 20 5/8" high Two handling flaws attribute to the sale price. Will be virtually unnoticeable when framed. 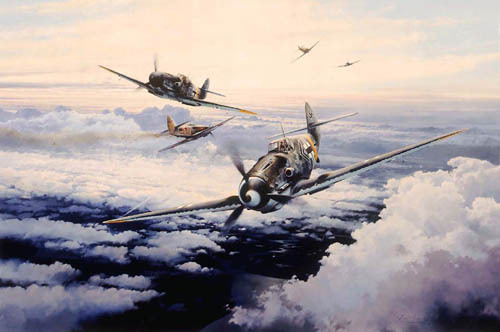 : The third print in Robert Taylor's Protagonists Series, featuring the Me109s of the Luftwaffe's most successful wing, JG-52.